I was collectiong in Wisconsin in an area called Lone Rock that has really sandy soil and took a big leaf litter sample, found maybe 15 of these guys in there. I gave them away to all my classmates in Dan Young's Immature Insects class and donated my collection to the Insect Research Collection at the UW. Dan actually wasn't suprised I collected them from that area. They're cute little guys :) I imagine you have to get them at just the right time of year too. The scraptiid larvae I've found in New Hampshire have all been under bark but this one was certainly near sandy soil if not actually in it. Maybe not so much so in New Mexico, but on the East Coast these are super rare. I think I read that only a handful of Scraptiid larvae are in collections anywhere. That weird fleshy terminal appendage that might be the 10th abdominal segment apparently falls off right before pupation and nobody knows why. I appear to have found an East Coast scraptiid larva. Alas, mine is not in a collection (except digitally). I tried to rear it, but it either died and vaporized or escaped from the pill sorter cubicle I had it in. Dan Young has identified this larva as a scraptiid. 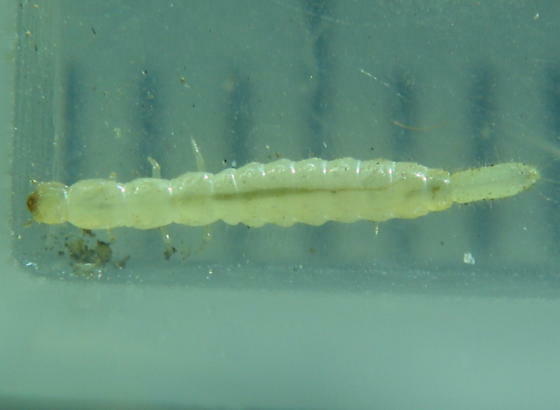 Interesting coincidence that on the very day I add adult images to one beetle family (Bori*dae) that has been represented only by larval images for about a year I find we have a new beetle family for bugguide represented only by larval images.